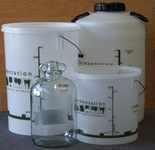 Brewing Bins, fermentation vessels, beer bottles, wine bottles, barrels and demi-johns for brewing beer and wine at home. We stock a variety of different sized beer and wine bottles, brewing bins, demi-johns, fermentation vessels, barrels and bottles to make the production and storage of your home brewed beer and wine as easy and trouble free as possible. 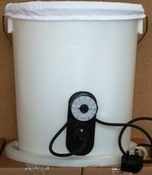 Available in sizes ranging from 2 gallons/10ltrs to 5 gallons/23 ltrs, all our brewing equipment is made from quality heavy duty plastic (or glass in the case of the 1 gallon demi-johns) and will give years of dependable use with proper care.